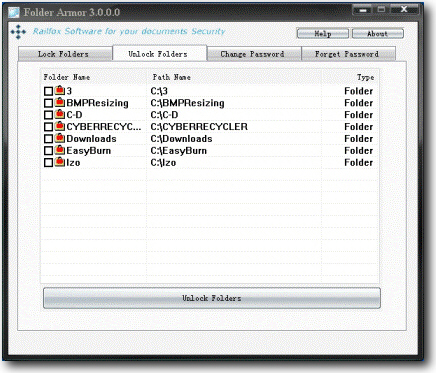 Folder Armor is a floder protection software. It is typically designed to ensure safety of your folders by locking it with a password. The program is more then easier to use and so much of simple. It has the screen with blue and grey color that gives a decent look. Folder Armor protects your folders in Windows, DOS, and Safe modes, even when you change your OS or boot from a disk. the folder can't be uninstalled without the correct password. ...... That's all! If you didn't disable the option "Integrate Folder Armor into shell" when installing the software, you can access Folder Armor from the standard folder context menu, which appears when you click on a folder icon from Windows Explorer or from the desktop. Folder Armor protects your folders in Windows, DOS, and Safe modes, even when you change your OS or boot from a disk. Folder Armor doesn't let you delete its own program folder, and it can't be uninstalled without the correct password. Qweas is providing links to Folder Armor 4.0.0.0 as a courtesy, and makes no representations regarding Folder Armor or any other applications or any information related thereto. Any questions, complaints or claims regarding this application Folder Armor 4.0.0.0 must be directed to the appropriate software vendor. You may click the publisher link of Folder Armor on the top of this page to get more details about the vendor.